Nico Rosberg says it is important he finishes ahead of Lewis Hamilton for the first time this year at Sunday's Bahrain Grand Prix. The German trails his Mercedes team-mate by 17 points after three races and has neither out-qualified nor finished ahead of the Briton so far in 2015. "I do think I can beat him here," he said. "But I also thought that the last two races and it didn't go that way. "I need to get points back as soon as possible." Double world champion Hamilton has won eight of the last 10 races dating back to the Italian Grand Prix in September last year and has beaten Rosberg four times in a row, including the final race of last season in Abu Dhabi. "It was very important to beat him in Malaysia two races ago," added Rosberg, who finished third behind Hamilton and race winner Sebastian Vettel in Sepang. "Of course last year he had a run of four wins and then right after that I had the best run of my year for quite a lot of time." Rosberg said he has no regrets about criticising Hamilton's driving in China last weekend. He accused Hamilton of compromising his race by backing him towards the Ferrari of Vettel. Mercedes managed to secure a one-two anyway. "We discussed it on Sunday evening and then everything was clarified and cleared," Rosberg said. "The team leaders did a very constructive meeting and then from then it was good and on we went." 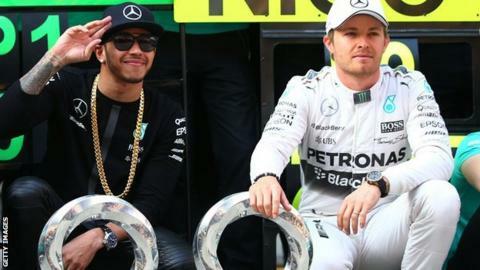 Asked whether his statements had handed a psychological edge to Hamilton, Rosberg said: "Maybe because I am standing here and I have to answer all these questions, but other than that no, I would do it again. "I felt the need to state the facts and there was the need to discuss things. I wouldn't do anything differently. And now for me it is a thing of the past. "I'm in Bahrain now here, to attack in the race car again and that's the best answer I can give - on the race track." Hamilton said he expected a "special" race with Rosberg and the Ferraris, and recalled the intense battle the Mercedes team-mates staged in Bahrain a year ago. Then, Hamilton was leading but Rosberg had greater pace, and the two fought a race-long battle for the lead, which Hamilton eventually won. "Last year we had an amazing race here," Hamilton said. "It was really fantastic, great fun - a huge, huge challenge both for Nico and for me. "I think with these tyres and with Ferrari in the mix, I think we could see a real special race here. "Last year I didn't qualify on pole here, I've never been on pole here so that's the challenge but as long as it doesn't get in the way of the challenge of trying to win the race." Hamilton said he expected another strong challenge from Ferrari, whose driver Vettel used better tyre life to beat Hamilton to victory in the heat of Malaysia. Hamilton said: "You have to assume that Ferrari will be very strong again, but I think we're going to try and take, from our experience with Malaysia, a slightly different approach. "I feel quite confident that as a team we can rectify that issue that we had in Malaysia. "But it's still going to be tough and Ferrari have been very, very competitive in the last couple of races. So I anticipate they will be very strong this weekend and our race is definitely with them."